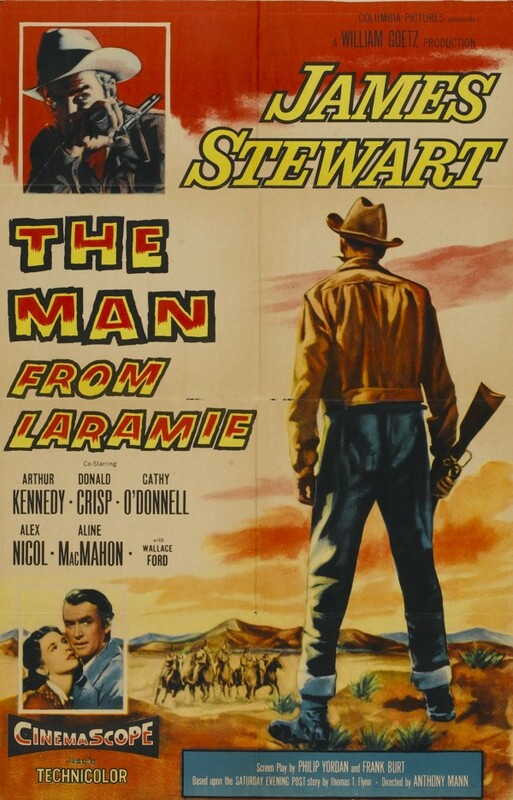 A man (Jimmy Stewart) determine to avenge the death of his brother by finding the person who sold an Apache tribe repeating rifles comes to a ranch owned by an aging patriarch (Donald Crisp) with a psychopathic son (Alex Nicol), where the ranch-hand (Arthur Kennedy) is convinced his filial loyalty to Crisp should be repaid in property. I agree with Peary that this film is beautifully shot, and makes excellent use of natural landscapes as a backdrop for the revenge-driven storyline. The violence itself is indeed “brutal” and shocking; we’re not used to seeing heroic Stewart treated as unfairly as he is here (dragged along the ground by a rope, shot calculatedly in the hand). Indeed, the psychopathy of “sadistic and crazy” Nicol — and Crisp’s unwavering loyalty to his son despite all evidence that he should reject him — are quite disturbing. I find it challenging to watch the “family” dynamics playing out between Crisp, Nicol, and Kennedy; this is a serious morass of denial and dysfunction, and it’s hard to have much sympathy for Crisp, who nonetheless is portrayed as deserving love (from Aline McMahon as his neighbor and former love interest) and understanding (especially given his failing eyesight). Meanwhile, Cathy O’Donnell’s role as Nicol’s cousin and Kennedy’s would-be fiance is underdeveloped; she’s beautiful, but her performance feels oddly distant. With all that said, there is enough brilliance here in staging, setting, and cinematography to make this outing worth a one-time look. No, but it’s recommended for one-time viewing. First viewing. A once-must, as a solid western and another fine Mann/Stewart collaboration. I watched this (for the first time) around the same time that I re-watched ‘Winchester ’73’. As I see it, it satisfies in every way that the best westerns can. When it comes to the Mann westerns – they are something akin to the Budd Boetticher westerns: they tend to be such sturdy, layered pieces that it seems a little silly to try to weigh one of them against another. Though some viewers may have their preferences in terms of strength, you pretty much can’t quibble with quality. ‘TMFL’ does stand out as holding a strong and memorable Stewart performance. I think I prefer Stewart (generally) in his ‘darker’ roles.